BBQ, Ribs & A Whole Lot More! Make sure to don your UGLIEST Christmas sweater and join us this Saturday, December 8th, for our 4th anniversary party! Scott Smith will play and we will have prizes for the tackiest sweaters! The party starts at 7:30…be there! What are you doing next Wednesday, November 21st? Make plans to head downtown for an evening full of festivities at Wholly Smokin’. We’ll have Mike and Mike from Sideswiped playing and the dining room turns into a dance floor at 10pm! Make sure you include us in your pre-turkey day festivities!!! Do you have a holiday party coming up at your home or office? 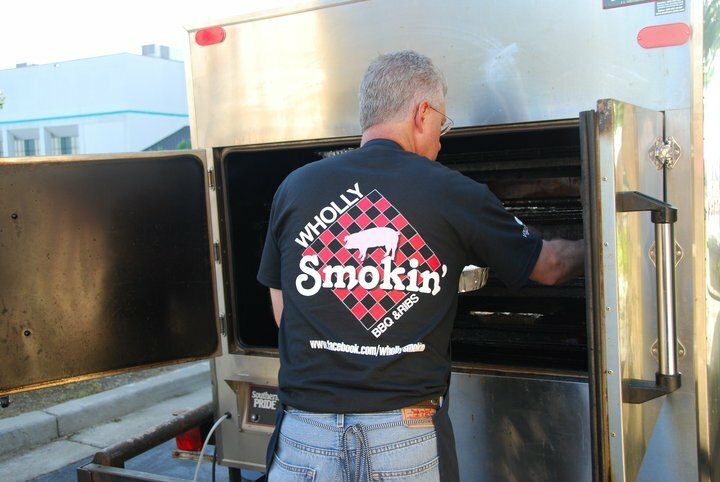 Let Wholly Smokin’ taking care of the catering for you! We not only make it easy, but we make you look good. Many of our menu favorites are available for catering–including pulled pork barbecue, brisket, spicy beans, spicy mac and cheese, goat cheese salad, and more! Let us work with you to create a menu perfect for your special event this holiday season. And, if you are looking for a venue for your party, remember we are available for private parties on Mondays. Give us a call at (843) 407-7545 and ask for Jackie or email Jennifer at jking18@sc.rr.com. Hello, friends! We wanted to take a minute to show you something pretty cool. Recently, Pee Dee Foodie wrote a review about our restaurant! We were honored to receive a good review from him, and we’d love it if you’d take a minute to read it and share it with your friends. Help spread the word about us! We have the best customers in the world. Thanks for making this job so much fun for us. Our restaurant was recently added on urbanspoon.com and we’d really appreciate it if you’d go on there and write about how much you like Wholly Smokin’ BBQ & Ribs. We love hearing all the positive feedback you guys have given us on Twitter and Facebook, and this is one other way of showing your support for our restaurant. Thanks, everyone! On Friday and Saturday (March 23 and 24), Wholly Smokin’ BBQ and Ribs cooked in the Big Brothers Big Sisters BBQ Festival in Florence. The event took place in the fields behind the Palmetto Peddler. Each team in the festival is given their meat on Friday, and they are to cook through the night to prepare their best pulled pork to be judged on Saturday afternoon. 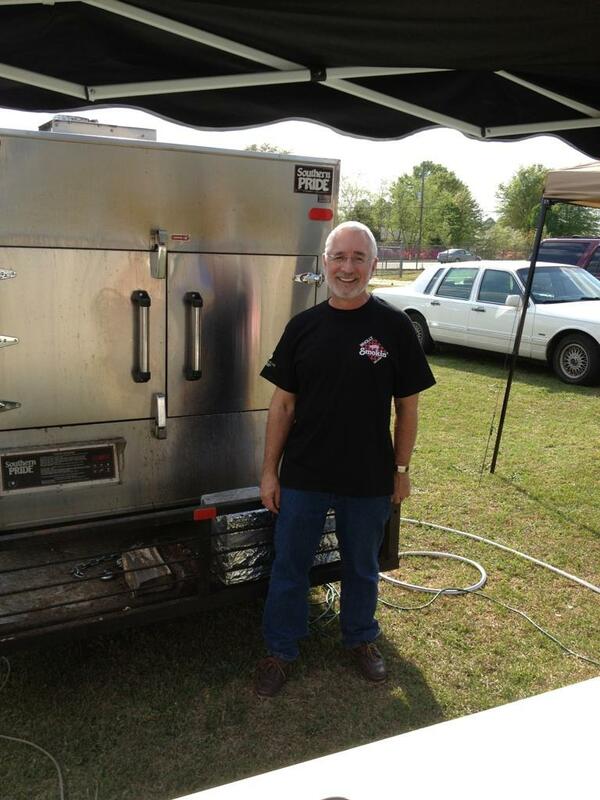 For this festival, Bill’s brother Mac Travis joined him as part of his cook team. To say they had a lot of fun is an understatement. The best of the pulled pork was sent to the judges and the winners were announced at 2:00pm. 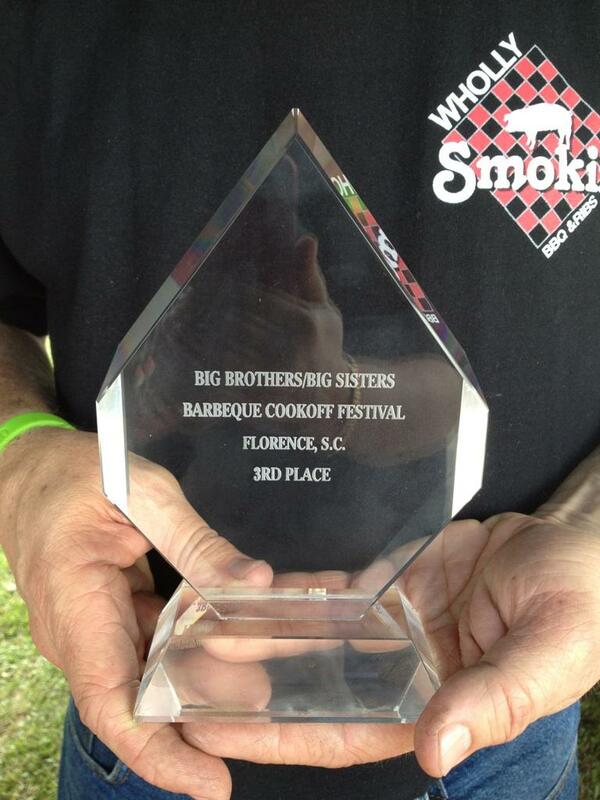 …And Wholly Smokin’ was one of those winners! 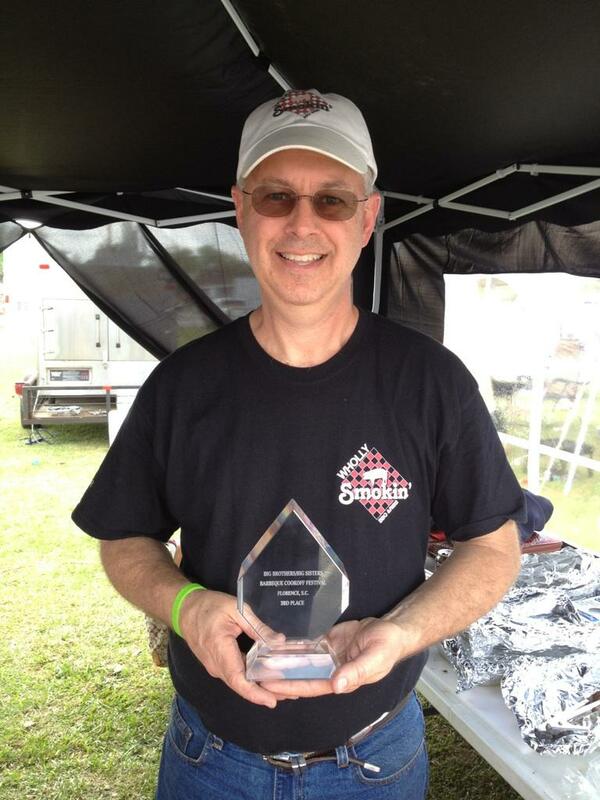 We placed 3rd in pulled pork, which is extremely exciting because now we have awards for BOTH ribs and pulled pork. Let’s check out that trophy. “Well, I knew we would win before I even came down there, so I brought some celebratory wine just for the occasion,” said Bill’s brother, Mac. Gotta love that confidence! We had a wonderful time at the festival and are really excited about this award. Just a few more weeks, Florence, and our restaurant will be open for business so you can try some of our award-winning food for yourself! And don’t forget, we still do catering as well. If you’d like to ask us about catering an event for you, please contact us with the “E-Mail Us” tab. 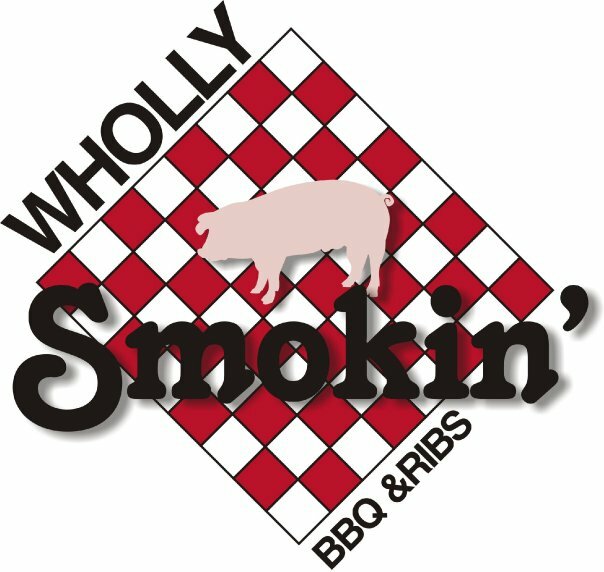 We at Wholly Smokin’ BBQ and Ribs are extremely excited about our upcoming restaurant in Florence. We’re even MORE excited that the buzz is starting to spread in the Florence community about what we’re doing! Check out these posts from the Morning News, Pee Dee Foodie, and Flossip Florence. We are excited about what is to come, and we are glad that you all are excited, too. BIG NEWS for all you Wholly Smokin’ BBQ and Ribs fans out there! We are going to be opening a restaurant! No longer will we be catering-only. We will have a sit-down restaurant on Celebration Boulevard in the old Roberto’s space, and a pick-up location in the old Travis Jewelers space! No exact date is scheduled for when we will open, but you can be sure we’ll keep you updated right here! Check back often for more info. Can’t wait to serve the people of Florence the BEST BBQ AND RIBS EVER!!! !